Matt Baker and Helen Skelton are in Somerset, and in a special film for Comic Relief, Sir Tony Robinson visits a charity that’s making a real difference to people’s lives. This week Countryfile is in Somerset. Matt Baker is visiting a farm that’s giving budding farmers a helping hand. 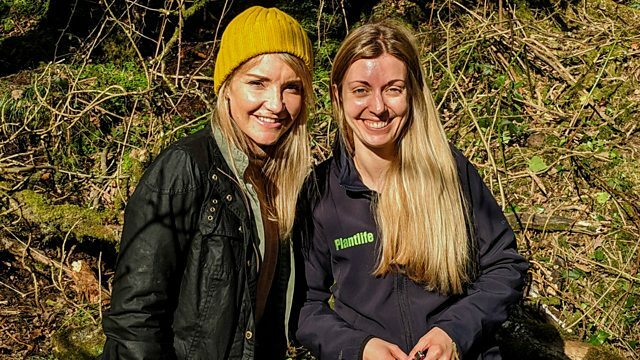 Helen Skelton’s got a liking for lichen deep in Exmoor’s woodlands, and she’s discovering the creatures that call the north Somerset coastline home. In a special film for Comic Relief, Sir Tony Robinson will be visiting a charity that’s making a real difference to people’s lives. Adam Henson is in Cheshire on a shopping trip with a difference - he’s buying livestock, and Tom Heap is looking at whether enough is being done to protect our coastal waters. Orchestra: Orchestra of the Royal Opera House, Covent Garden. Conductor: Mark Ermler. In a hidden valley high up in Somerset's Quantock Hills is a farm that’s all about giving people a helping hand onto the farming ladder. They call it a share-farm and Matt's visiting to find out more. This 250-acre organic farm is owned by James and Henrietta Odgers, who moved here 16 years ago. James and Henrietta share their land, giving people the opportunity to learn traditional farming practices whilst running one of the farm’s 9 different ventures. Helen’s got a liking for lichen and is seeing a delicate green-fingered operation in action. Tom’s looking at whether enough is being done to protect our coastal waters. Marine Protected Areas - or MPAs – have been set up off the UK’s shores to defend some of our most at-risk coastal waters. But, to ensure their success, proper enforcement and management are needed to stop illegal dredging. Some fear that isn’t happening – allowing scallop dredgers to illegally enter protected waters and put the rich biodiversity of the seabed at risk. In a special film for Comic Relief, Sir Tony Robinson visits Cornwall to see how a charity there is making real difference to people’s lives. The Sensory Trust is a UK charity that turns to nature to improve the health and well-being of people suffering from a range of problems, including dementia. Today, Sir Tony joins the "Happy Wanderers", a walking and activity group set up to get those people and their carers out into the great outdoors. Somerset may be better known for its moors, meadows and Levels - but its sweeping coastline has some of the highest cliffs in England and one of the longest stretches of sand in Europe. For the past two years, the trust has been carrying out the area’s first coastal survey, to record and map the hidden inhabitants along this 47-mile stretch of coastline. Back at Stream Farm, there's a real sense of belonging and fellowship at the heart of its weekly get together. Matt and Ellie tuck in to the fruits of the labour of those who work and live in this share-farm community.